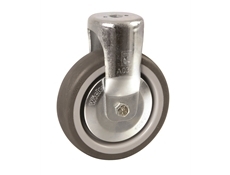 Braked institutional castor with bolt hole fitting. 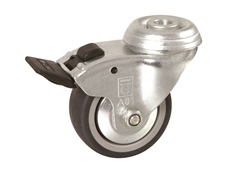 Grey TPE tyre with 100mm diameter and 100kg load capacity. 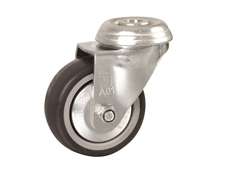 Press steel fork assembly zinc plated - Braked head and double ball race and head seal - Nut bolt and axle - Wheels with TPE-tyre (thermoplastic elastomer) on polypropylene rim - Plain bearing hub complete with thread guards. 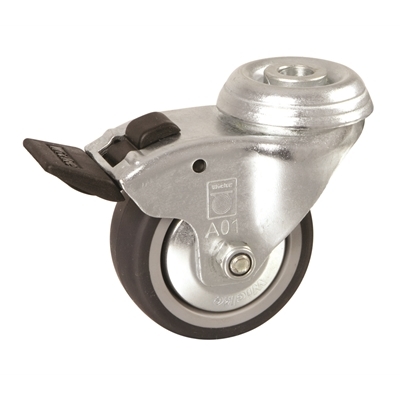 Please note: The castors can be purchased complete with expander fittings. The expander fittings can also be purchased as a standalone item.